Brandywine, Germantown, Valley Forge, Monmouth. These are some of the most famous locales of the Revolution, yet not one was the scene of an American victory. 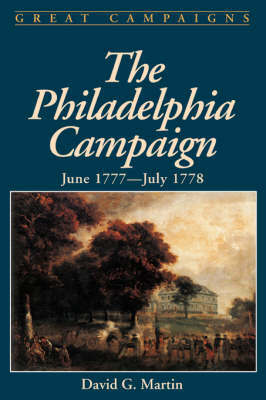 The Philadelphia campaign, which ran for well over a year from early 1777 to mid-summer 17778, is recognized as the high point of the Revolution. It was a campaign during which the British won almost every battle and gloriously seized their objective, the Colonial capital at Philadelphia, yet they were not able to win the war. Thanks to the fortitude and determination of leaders like Greene, Wayne, Morgan, Lafayette, Von Steuben, and especially George Washington, the brave American citizen soldiers refused to admit defeat and weathered the dark days of Valley Forge to emerge a more efficient fighting machine, determined to win the war no matter how long it took. Such was the patriotism of the Colonial troops who won their nation's independence from the professional soldiers and Hessian hirelings of King George.Military historian Dr. David G. Martin's The Philadelphia Campaign is a lively account of an epic period in American history. His narrative includes detailed strategic and tactical analyses of the movements of the general and their battles for the city of Philadelphia along with the story of hardships and trials of soldiers on both sides. What emerges is a story of courage, incompetence, tenacity, jealousy, and intrigue. The book is well illustrated with contemporary drawings and maps. A reader's guide provides a basis for further study and there is information about sites from the war which can still be seen today. Sidebars provide information on the period such as the leadership o both armies, the weapons they used, the role of African-Americans in the Revolutionary War, and the stories of heroines Lydia Darragh and Molly Pitcher.